I was walking home along Third at dusk when I saw a sign at 48th that I hadn't ever noticed before. It must have been uncovered in the last year or so, because I walked that strip frequently in '14/'15, and am sure I would have seen it. Next to a faded McDonald's sign, what seems like a somewhat desperate endorsement. "John F. Gangemi is my friend." 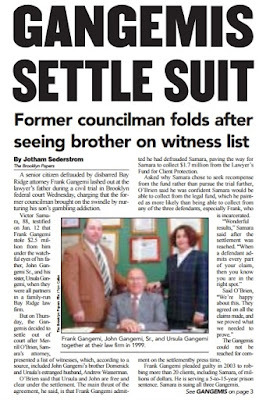 Gangemi, a lawyer with an office in Fort Hamilton, is the father of Frank Gangemi, who was convicted in 2003 of embezzling money from senior citizens. Gangemi senior and daughter Ursula Gangemi were implicated in the case, but were not charged. 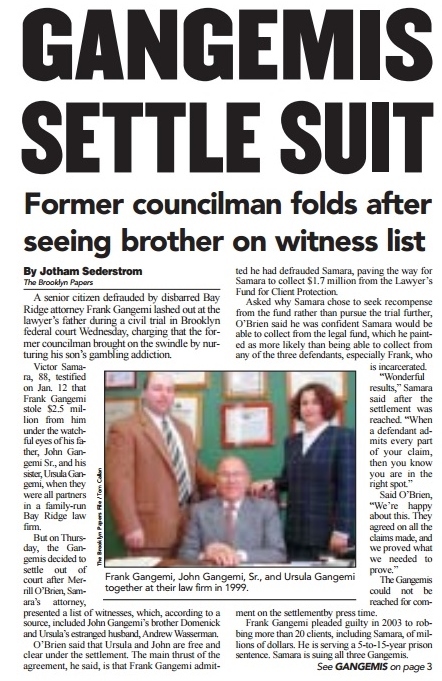 Authorities also investigated suggestions of mob-related witness intimidation, but these were never substantiated. A civil suit against the three Gangemis was settled out of court in 2005. In 2013 John Gangemi, who had been a city councilman in the 1970's, announced an intention to run against Eric Adams in the Democratic Borough President primary. He expects friends and family members to help boost his near- empty campaign coffers - and even hopes to land the support from the Kings County Democratic organization. Months later, his petition to run for the office was deemed invalid. But who was behind the expressway-level message on Third? One has a sinking feeling that it was self-penned. Or painted. When was it put up there, and was it perhaps, a part of a bigger ad, rendered incomplete by the passing years & the passing layers of auto body/scrap metal,/personal injury bills? A Google maps search gives it a pre-2007 date. Was it related to the 70's Council campaign, or was it an attempt to improve Gangemi's image at the time of his son's trial? Anonymous today, perhaps as ever, the sign now emits an altogether urban angst. As drivers and pedestrians glimpse it as they pass along, from down below or side-by-by side, it strikes a chord, whispers a question, unsettles the moment. Shades of the Naked City. I remember an orange Cadillac cruising around Bay Ridge in the 70's with "John F Gangemi is my friend" painted on the side! The orange billboard -- "John F. Gangemi is my friend" is from Gangemi's 1972 congressional race against Hugh Carey. He had a car painted with the same slogan. Gangemi was a Republican at the time, and nearly rode Nixon's coattails in Congress. He came up short in his first bid for public office by several thousand votes. A close race at the time. He used the same slogan a year later to win one of two At-Large Council seats representing the borough of Brooklyn.